Central spinal stenosis is a diagnostic term which means the exact same thing as the more common simple wording of spinal stenosis. However, central stenosis differs from neuroforaminal stenosis and the scope of this article is to help you to understand the difference between these two diagnostic verdicts. This comprehension is the first step in really taking an active role in your own treatment. Without this knowledge, you are merely guessing at what is wrong and therefore do not know what must be done to fix it. This is a big mistake. Let’s investigate the similarities and differences between central and foraminal stenosis in detail. This essay tackles the vital task of clarifying central stenosis is easily digested language. When a person is diagnosed with spinal stenosis, this means that the central vertebral canal has been narrowed. The space through which the spinal cord passes is decreased in size, potentially enacting symptoms by creating cord compression. In some cases, central canal stenosis can also cause nerve root compression within the central canal. This is very common in the lower lumbar spine, where there is no spinal cord and the cauda equina nerve roots are still traveling in the central canal space. Foraminal stenosis is when the side openings in the individual vertebrae are narrowed. The nerve roots pass through these foraminal spaces as they exit the spinal column at every vertebral level. When the opening becomes too narrow, the nerve root may be compressed within the foramen. This is commonly called a pinched nerve. It is certainly possible to have one or both of these conditions existing in the same patient, at the same or different vertebral locations. Sometimes, a stenosis issue is focused, such as in the case of a single large bone spur, a vertebral fracture or a herniated disc. 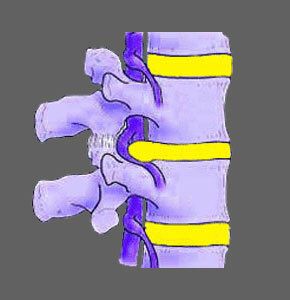 Other times, the stenosis is generalized throughout a region or the entire spine. Either of these scenarios can affect the central canal and/or the neuroforamen. If you have been diagnosed with any of these conditions and are not sure exactly what they mean, be sure to discuss the diagnosis with your doctor for a better idea of exactly what you are dealing with. Central stenosis is generally considered much worse than neuroforaminal stenosis. The worst a narrowed foramen can enact is a unilateral compressive neuropathy condition. Meanwhile, central stenosis will possibly affect all the areas and processes which exist below the affected level, potentially causing a wide and nightmarish range of spinal stenosis symptoms. These conditions are more difficult to treat than foraminal stenosis and have a far greater chance statistically of coming back after treatment. As far as accurate diagnosis, central stenosis which is symptomatic is easier to correctly identify than foraminal stenosis, which is often theorized to exist incorrectly. In our experience, we rarely see actual pinched nerves, but see many patients who have been diagnosed as such, usually by chiropractors and without proper imaging studies. If these doctors knew anything at all, they would not make the diagnosis, since the symptoms often do not correlate in location or expression to the proposed diagnostic theory at all.